For all of you Samsung (as well as other compatible) device owners, Tronsmart is hosting a coupon code sale on its Fast Wireless Charger via Amazon. 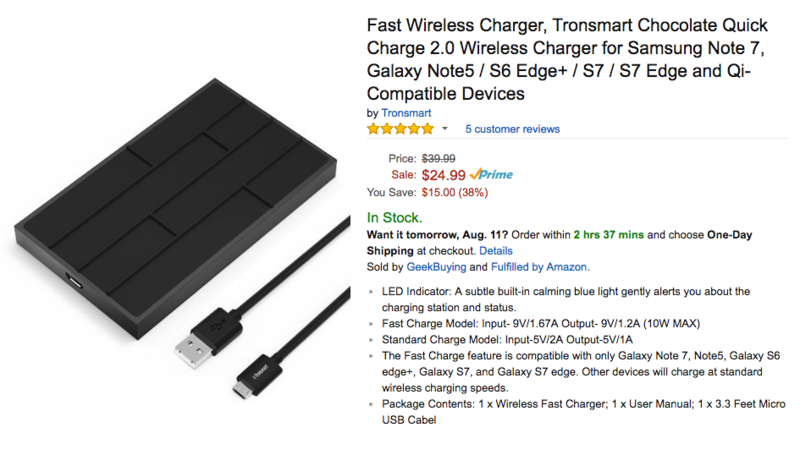 Without the coupon code, the price of this charger is listed at $24.99 for Prime members. With the code added, the price drops to $18.99, which is a great price for a wireless charger capable of fast charging. As for technical specs, here they are. The list of compatible fast wireless charging devices is Galaxy Note 7, Galaxy Note 5, Galaxy S6 Edge+, Galaxy S7, and Galaxy S7 Edge. If you own a device that features standard wireless charging, this charger should work just fine, too. If you are interested, simply input the code FASTCHAR when checking out.